Asian Pears are members of the Rose family and the Pyrus genus, which contains 23 species, found in Asia, Europe, North Africa and around the Mediterranean. Only two species are commercially grown, Pyrus communis, the European pear, and Pyrus pyrifolia, the Asian pear. 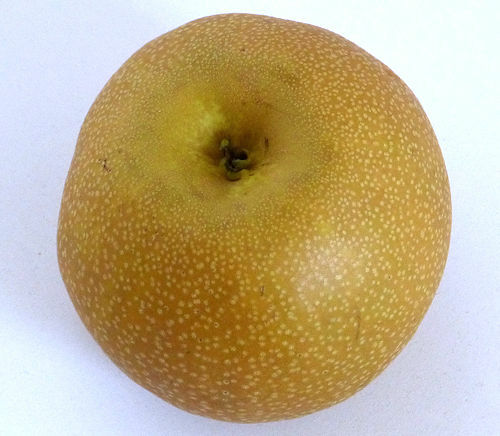 Dozens of Asian Pear cultivars have appeared in North America. Mature Size: 30' high and as wide. Dwarf cultivars can be 12-18' high. 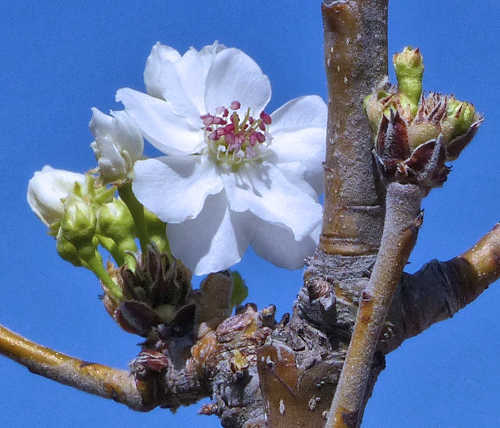 Bloom: Late winter or spring, before leaves have fully expanded. Self-fruitful: Partially. Another pyrus cultivar of similar bloom time is needed within 50' to improve yield. Fruit: Round with tan skin and speckles or yellow-green smooth skin. The flesh is firm and crisp. Months for fruit to ripen: 4-7. Fruit should be allowed to fully ripen on the tree. They are ripe when they are strongly fragrant. They do not soften when ripe like the European Pear. Storage after harvest: Fruit will continue to ripen at room temperature if picked early. They will store 2-3 months in a refrigerator with good air circulation. Leaves: Green, broadly lance-shaped, finely serrated or smooth edges. Roots: Often grafted onto a special rootstock. Wildlife: Attracts bees and birds. Toxic / Danger: No. Seeds are slightly poisonous if chewed, but no danger swallowed whole. A large number of chewed seeds would have to be consumed to have a serious effect. Origin: China. Cultivated for more than 3000 years. Chill hours: 900-1000 is common. A few cultivars need 250-300 hours and these are the best choice for USDA zones 8-9. Heat tolerant: Yes for certain cultivars and hybrids. Drought tolerant: Yes, when established. Water after becoming established: Basin irrigate, allowing soil to dry out completely between waterings. Deep water weekly when fruiting, monthly when not fruiting. Too much water increases susceptibility to Fire Blight, and also induces iron deficiency, which turns leaves yellow. Slightly acidic soil eliminates iron deficiency. Soil: Well drained, deep, tolerant otherwise, withstands pH 5.0-7.5 (strongly acidic to neutral) but performs best in pH 6.0-6.5 (slightly acidic). Fertilize: If an Asian Pear is growing more than one foot a year, it doesn't need fertilizer. Too much nitrogen increases susceptibility to Fire Blight. Mulch: 3" of aged compost spread under the canopy and one foot away from the trunk to reduce moisture loss and heat stress. Planting: A location without late frosts is best. Prune: Remove young fruit when marble sized so that no more than one fruit remains for every 6" of branch. This reduces branch breakage and allows remaining fruit to grow larger. Litter: Leaves in fall, unharvested fruit. Propagation: Cuttings, seed planted in a pot immediately after becoming ripe. Pests: Fire Blight, although less of a risk than with European pear. Look for fire blight resistant cultivars. Uses: Ornamental, edible fruit. Eaten out of hand or used raw in salads, but not normally used for cooking due to high water content. These trees have many common names including Sand Pear, Salad Pear, Apple Pear, Chinese Pear and Japanese Pear.